I was out of the office for a few days only to find THIS on my desk. 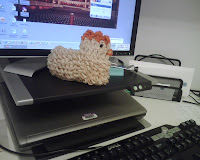 No one seems to know who left this here but a sudden IM from Rhonda asked if I liked my "stapler cozy". Typically I would need warning a little time before I ran into something like this. it's cute! don't be rude by teasing the kindhearted lass (or lad...) who knitted this fine rooster for you. it beats the knitted toaster cover or tissue box holder. I agree with anonymous. In fact, an argument could be made that this kind of thoughtless teasing is rude! Say it isn't so, fair arbiter of polite society. As a general rule, gifts knitted by hand are always inherently rude, as no one in their right mind prefers a handmade, knitted gift.